The mid-year Corvettes are beloved vehicles for both their striking styling and thrilling V-8 engines. Making a lightweight sports car with a powerful engine that makes the right sounds is central to the Corvette mystique. The 1963 Corvette Grand Sport represents the pinnacle of this idea, perhaps making it the ultimate Corvette. You often hear the term racer for the street, but rarely is it true. The engine might make the requisite power, but creature comforts usually dictate that any racer must be softened for the street. In the case of the Grand Sport no such concessions were made. The primary goal of this special model was all about weight savings to enhance speed. Steel was swapped for lightweight aluminum in the metal frame birdcage, steering box and differential housing. Lightweight fiberglass body panels were used and magnesium wheels replaced the usual steel rollers. The result was startling. The Grand Sport weighed a mere 1,900 pounds compared to the stock Corvette’s 3,250. With only five 1963 Grand Sports produced, the values of these cars are now stratospheric. 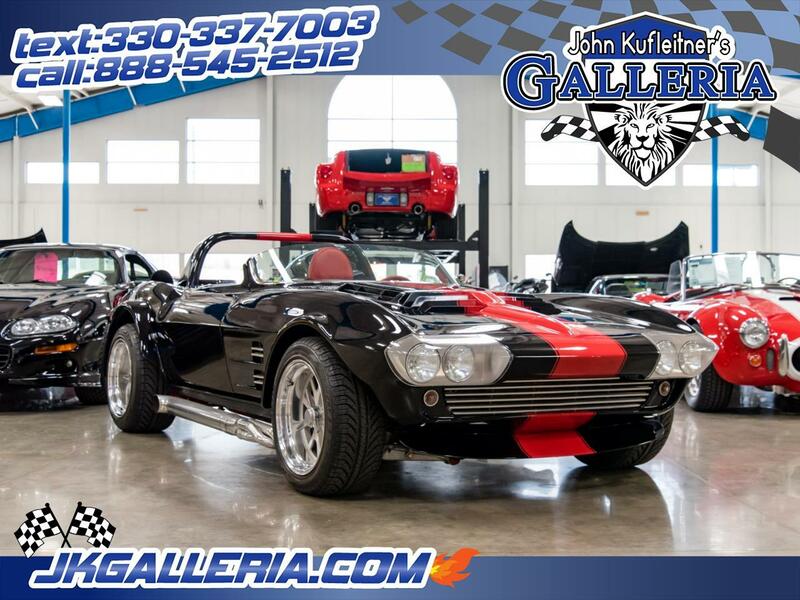 Absolutely Pristine 1963 Corvette Grand Sport Replica that is Simply Stunning inside and out! This was a No Expense spared build at a reported cost of $150k ! This car offers a chance to experience the feel of an original Grand Sport at a mere fraction of the cost. With a 377 CI small-block stroker V-8 engine with Weber side-draft carburetors producing 550 HP, this car is not for the meek of heart. In keeping with its intended use as a road-course racer, this car is equipped with a Super T10 4-speed manual transmission. Set on a round tube frame, this Grand Sport Replica features a Griffin radiator, C4 Corvette suspension and brakes, Auto Meter gauges, power rack-and-pinion steering, custom vintage wheels, coilover shocks, heavy-duty sway bars, a 3:08:1 Positraction rear axle and plenty of thrills. I have Clean and Clear Ohio Title listed as 1963 Corvette.